Baan Bon Khao is one of the most welcoming villas we’ve stayed at, and we came away from our all-too-brief stay here feeling fully refreshed and restored. 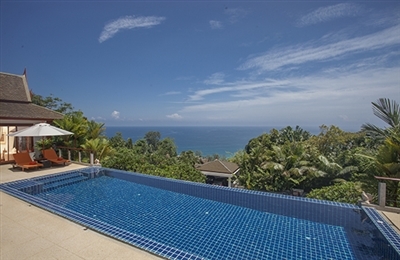 With its spectacular sea and sunset views, friendly service and excellent Thai food beautifully presented, the villa is a truly inviting oasis. Everything in the villa, from its majestic vaulted ceilings down to its polished wood floors, looks fresh and new, so we were surprised to learn that it is more than a decade old. Having been a private residence for many years, the villa opened to guests for the first time after an extensive renovation in 2015. It further benefits from having a full-time professional team on site, with the helpful villa manager as the main contact point. The chef and housekeeping staff have limited English skills, but they’re keen to please, and we were impressed especially with the meal service, presented and served in such a way that it felt like an event, even for our casual breakfast on the pool terrace. 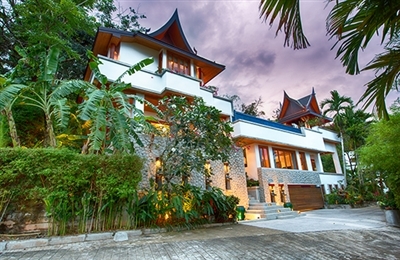 We also loved the Northern Thailand roof design, which really adds some grandeur to the open tropical look of the villa. Our camera’s memory card quickly filled up one evening as we tried to capture the silhouette of the pavilions at all angles against a blazing sunset sky reflected in the infinity-edge pool – one of those unforgettable sights that Instagram was created for! Being in an estate limits the sense of total privacy here, though the villas are arranged carefully to ensure none intrude upon one another. The villa’s lofty position still makes it a tranquil and secluded escape, even though it has to share the hill with neighbours. With a warm yet elegant style, caring staff and a peaceful location on a lush hillside, Baan Surin Sawan is an all-round superb tropical holiday villa. 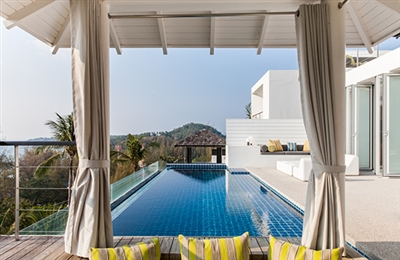 Though the Surin hills area is becoming more built up, this villa remains well out of the fray and we were delighted to see many birds and butterflies flitting over the pool, even a squirrel scampering around in the palm trees. The trickle of flowing water and the light tinkling of brass temple bells in the breeze, made a soothing soundtrack to our stay. The friendly, efficient service by the villa manager and chef (overseen by a professional management company) is complemented by the care of the owner’s long-term live-in maid. Thoughtful touches included being welcomed with a cold coconut drink, refreshing towels and a garland on arrival and being offered the owner’s own homemade muesli mix at breakfast (quite tasty by the way). The full-time chef specialises in Thai cuisine and we were given the chance to try some of her Southern Thai specialties including the delicious poh-pia pak (spring rolls with spicy dipping sauce). We selected our dishes individually but there’s a fixed-price set meal menu, too, which we’d recommend as a good sampler to try for guests unfamiliar with Thai cuisine. The dining room is rather grand in design and perfect for evening meals. For outdoor dining there’s a table in the back garden barbecue area and the poolside sala could be used for an informal meal. If we’d stayed longer we would have probably arranged to have the garden table brought out to the pool terrace so we could enjoy the sea views while dining alfresco. The overall layout of the villa offers a good set-up for two families or an extended family. The entertainment room and pantry plus two ensuite bedrooms on the bottom floor give the feel of being in a separate apartment with plenty of privacy, though we expect couples might battle for the upstairs master suite, which sits majestically in its own poolside pavilion with the best sea views! If there was ever a villa built to lift your spirits, Villa Napalai is it. Upon entering Napalai, we were most struck by its vibrancy – so many bright colours in every room – and the stark beauty of its sheer-white chic terrace contrasting with the vivid blue of the pool, sea and sky. Then, in addition to its cheering tones, Napalai is laden with fun facilities for all ages, so many in fact that we were sadly unable to try them all on our brief stay! Spoiled for choice, we decided to skip the gym and spa and opted for swimming and relaxing poolside, plus spending a lot of time in the games and play rooms. Our kids, six and eight, loved frolicking in the playroom, though most of the toys and plastic slide were better suited to toddler-aged children. The pool table in the games room saw a lot of fierce competition, too. Overall, we felt that Napalai, which means “a place in heaven”, offered a lot of choice and space to satisfy guests wishing for a peaceful place to lazily unwind in the tropics as well as those seeking a fun, active holiday. At the time of our visit (June 2013), Villa Napalai was new to the rental market and as such the service was a tad spasmodic at times. The staff seemed more preoccupied about getting logistics right than anticipating their guests’ needs. However, since we were among the first guests to visit we expect these issues to be ironed out as the team gains more experience under the guidance of the professional management company that operates the villa. The villas within the estate are quite close together, and the terrace of the villa next door comes into partial view from Napalai’s pool terrace. However, since Napalai is at the end of the road, it benefits from having only one nextdoor neighbour and an unobstructed view towards the hills to the north. 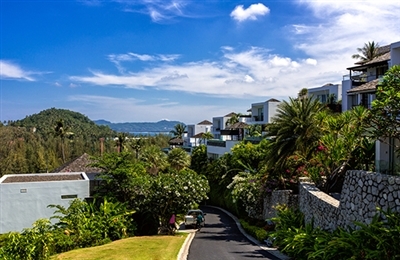 Villa Sammasan is a great family villa – stylish enough to satisfy those seeking a touch of luxury but comfortable and welcoming for kids, too. We spent most of our time here on the pool terrace, where the kids flipped for the pool, literally, as they spent a lot of time perfecting their forward jump flips while we watched in comfort from the shady sala. We had a short stay yet the weather conditions ran the gamut from glorious sunshine to torrential rains, and the villa was a lovely haven either way. The ultra comfortable living room and media room were great retreats for games and movies when the sun disappeared. The larger four-bedroom Villa Napalai next door is under the same management so big groups or extended families needing more space might consider booking Sammasan and Napalai together. The staff here are helpful and amazingly, considering the picky eaters among us, the chef’s meals were relished and devoured by all. Dinner was a standout event: we thought we’d ordered far too many dishes, but they were so delicious we finished them all. The yam nue yang (spicy beef salad) and pla nueng manao (steamed sea bass in lime and garlic) were simply spectacular, and we watched in awe as our kids ate the fish up like candy.